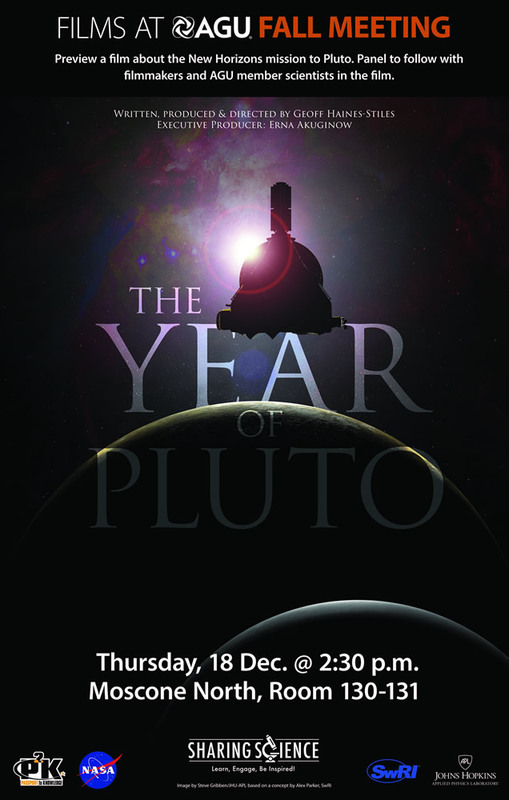 Also at AGU: a sneak peak at and panel discussion on “The Year of Pluto,” a new film on the mission by Geoff Haines-Stiles, producer of Passport to Pluto, Passport to Pluto and Beyond, and several New Horizons podcasts. 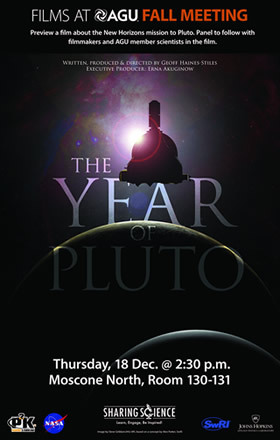 The screening and discussion will not be webcast, but you can watch the Passport to Pluto videos here. After nine years and three billion miles in flight, it's "mission on" for New Horizons at Pluto! New Horizons team members will preview the upcoming Pluto encounter for media attending the American Geophysical Union Fall meeting on Thursday, Dec. 18, at 11:30 a.m. PST (2:30 p.m. EST). They'll cover why we're traveling to Pluto, what we want to learn, how we're going to collect this new information, and our efforts to bring the excitement of this incredible voyage to the public. Watch the workshop webcast here. Speakers include Alan Stern, New Horizons principal investigator, Southwest Research Institute, Boulder, Colo.; William McKinnon, New Horizons co-investigator, Washington University in St. Louis; Mark Holdridge, New Horizons encounter mission manager, Johns Hopkins University Applied Physics Laboratory, Laurel, Md. ; and Cathy Olkin, New Horizons deputy project scientist, Southwest Research Institute.